Ireland's lost generation: What happened without the 20-somethings? Part one. With emigration taking its toll, we look at the Ireland that is being left behind. In part one, houses and public houses. 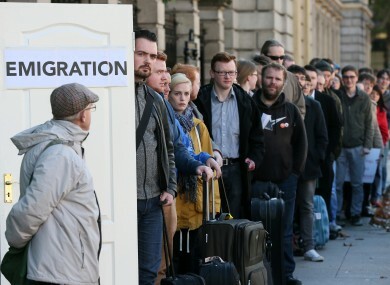 IRELAND HAS THE highest net migration in Europe. Nobody leaves any country, including Kosovo and Lithuania, more than leaves Ireland. Our net migration in 2012 was around 35,000, but the numbers of indigenous Irish leaving are higher. Without question, the hardest hit generation are those aged between 21 and 28. Over 30 per cent of Irish youths receive some form of income support. But what happens without them? What is the impact on Ireland? In part one of three, we look at the impact on two huge parts of Irish society: property and the pub. Publicans aren’t exactly keen to advertise how bad things are in their sector. One publican who spoke would only do so under condition of anonymity. He says that his suburban Dublin pub has never seen business as affected. “If you’re a pub like us, you’re having to do everything to compete. We’ve had three places close locally lately, but we’re not seeing a pickup in business. Places in town are still attracting a lot of people, because the people who are leaving are from across the country, but we had a gang of about 10 regulars all head to Australia together. With a combination of drinking at home and a country with less disposable income across the board, the emigration problem is exacerbating a problem for the pub industry. “The thing is,” says the publican “The kind of people we’re losing would have been your best customers, because they drank a lot, being perfectly honest. But without them, you’re forced to try and bring in those that haven’t left. “So you have a load of pubs spending huge money on smoking areas, function rooms or entertainment that wouldn’t have had. Another struggling industry that won’t illicit sympathy are estate agents. Their industry has suffered a seismic shift in recent years and, with economic recovery on the horizon, they are looking for customers. Customers who aren’t there. “We have a few houses knocking around,” says a West Dublin estate agent, “But really, who are you selling to? “Credit remains a massive problem, but so does the age profile. “Say I have a one-bedroom apartment in Clonee. The kind of people who would have wanted that are a couple, aged 24-28 with no kids. “What emigration has done has left us with a lot of properties that were rentals, and fewer people to sell them to or rent them out to. While house prices are increasing in Dublin the estate agent says reports from the rest of Ireland are “pretty awful”. He adds that he knows that estate agents are particularly popular, but says that knock-on of emigration is affecting jobs. “These are the people that would have been spending money. Not just on rents or mortgages, everywhere. Next week, we look at the effect on education and sports. Email “Ireland's lost generation: What happened without the 20-somethings? Part one.”. Feedback on “Ireland's lost generation: What happened without the 20-somethings? Part one.”.